The Fiat Topolino was one of the smallest cars in the world at the time of its production. Launched in 1937, three models were produced until 1955, all with only minor mechanical and cosmetic changes. It was equipped with a 569 cc four-cylinder, side-valve, water-cooled engine mounted in front of the front axle,( later an overhead valve motor ) and so was a full-scale car rather than a cyclecar. The radiator was located behind the engine which made possible a lowered aerodynamic nose profile at a time when competitors had a flat, nearly vertical grill. The shape of the car's front allowed exceptional forward visibility. Rear suspension initially used quarter-elliptic rear springs, but buyers frequently squeezed four or five people into the nominally two-seater car, and in later models the chassis was extended at the rear to allow for more robust semi-elliptic springs. With horsepower of about 13 bhp, its top speed was about 53 mph (85 km/h), and it could achieve about 39.2 miles per US gallon (6.00 L/100 km; 47.1 mpg-imp). The target price given when the car was planned was 5,000 lire. In the event the price at launch was 9,750 lire, though the decade was one of falling prices in several part of Europe and later in the 1930s the Topolino was sold for about 8,900 lire. Despite being more expensive than first envisioned, the car was competitively priced. Nearly 520,000 were sold. Many were hoping for a civilian version of this kit and it did not take long for Bronco to produce one. This one does have some differences compared to the military version. For instance, there is no trailer as one is not required. 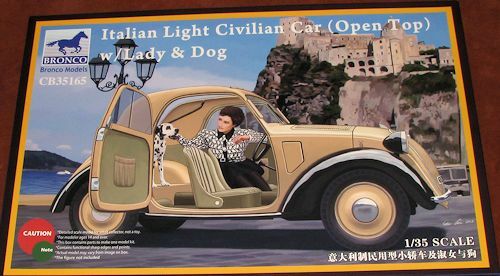 This kit includes a lady driver and her dog so you do not get the military figures provided in the earlier kit. The biggest difference is that this one is a soft top whereas the earlier kit was a hard top. Staying with this subject, the kit top can be built either with the canvas top folded up or stretched out to enclose the interior. The kit is still the same otherwise. There is a full engine and cooling system, the suspension is quite detailed and complete. There are plastic tires/wheels and you can turn the front steering. The interior gets civilian seats and this one has pockets in the doors. Both the very front of the bodywork can be posed open as can the louvered pieces in the center of the hood. Doors have two window inserts; one for fully closed and one with the forward piece slid open. There are what appear to be trafficators for the forward windscreen posts. The canvas top includes the erection/retraction mechanisms for both up and down options. Windscreen wipers are also part of the package. A photo etch fret is included tht provides license plate holders and some other very small parts. Instructions are very well done with any optional steps clearly shown. 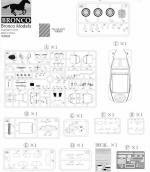 Decals are simply for license plates and you are offered both black and white backgrounds. A wide selection of letters and numbers are provided so you can do any plate you wish. The color guide shows three cars, all with black fenders. One is a dark maroon, one a beige and the other a black. If you search the net, you will find other colors. I should add that any chrome will need to be painted, but there isn't much on these cars. Though it has a military tie-in, it is great to see these pre-war cars being produced in kit form. Kudos to Bronco for providing one of the cooler ones.